Virginia's largest Marine Aquarium Specialty Company! 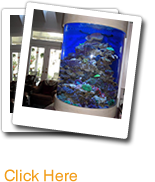 At Richmond Aquarium, we specialize in custom aquarium designs for elegant homes, distinguished companies, restaurants and medical offices. From aquarium leasing and maintenance to freshwater and saltwater fish food, we provide both quality service and supplies for all or your aquarium needs. Our staff of service technicians, aquarists and marine biology consultants are dedicated to the highest standards of Richmond aquarium service excellence. We develop, install and maintain some of the most sophisticated and elegant corporate (and residential) aquariums in Virginia, Maryland and North Carolina. For our corporate clients in particular, we know that reliability and experience are an absolute must. We are available 24/7 and we have 13 years of experience to deal with any accommodations, occasion, emergency or service need that may arise.